Place the script in your SendTo folder. 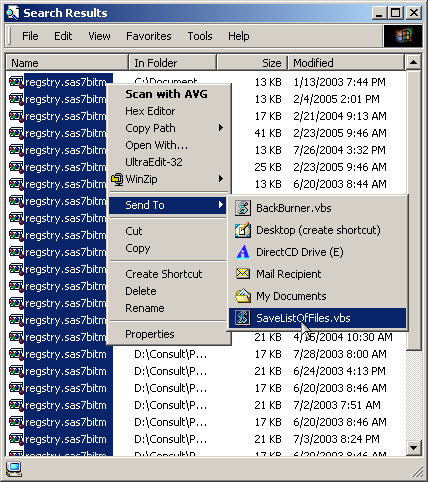 In a Windows Explorer listing pane, highlight one or more files. Right click on the selection and send to SaveListOfFiles.vbs. A text file listing the highlighted files will be created. Useful for saving search results. Download the script or copy it from below. After saving a temporary file is created. Rename and move the file to a more permanent location if necessary.
' Send me some mail if you find this useful.
' Purpose: In Explorer, select files and be able to save the names of the files selected.
' Very useful for saving results of searches. filename = fso.GetSpecialFolder(2) & "\Move-and-rename-this-List-of-files.txt"
This page was last updated 23 February 2005.